Although the Community Board overwhelmingly approved the American Museum of Natural History’s proposed expansion, there are still many valid concerns that the Community has voiced over the past eleven months since this proposal concept was made public. Knowing what we do now, LANDMARK WEST! prepared the following testimony for the Full Community Board meeting of CB7. The project’s next milestone is the Landmarks Preservation Commission Certificate of Appropriateness Hearing which is scheduled for Tuesday, October 11th at the LPC, 1 Centre Street, 9th Fl. North. Please read on for concerns which LW! hopes will be addressed both at the Commission and as the design develops. UPDATE! READ LW! Testimony from the LPC, on the DESIGN and LANDSCAPE and on the MASTERPLAN. LANDMARK WEST! wishes to comment on the application to demolish three existing buildings, and construct a five-story (up to 105′ tall), 180,000-gross-square-foot addition on the Columbus Avenue side of the NYC Individual Landmark American Museum of Natural History at 79th Street, a site located in the Upper West Side/Central Park West Historic District. This expansion, occupying approximately a quarter-acre of public parkland is for the Richard Gilder Center for Science, Education and Innovation. The proposed addition does not exceed the overall height of the existing buildings to the north and south. In plan, the proposed addition steps back at each touchpoint with existing buildings. The proposed addition uses Milford pink granite, echoing the material used extensively throughout the historic buildings that comprise the Landmark. Other aspects of the proposal fall short of the design concept, however. The Milford pink granite does not carry into the interior of the proposed addition; instead, it stops short at the glass curtain wall and downgrades to concrete on the inside. As a result, the building lacks the total quality and design integrity that we expected from the original concept—indeed, that we expect of such a prominent addition to a Landmark of such stature—contradicting any comparison with the majestic, cohesive Theodore Roosevelt Memorial that marks the Central Park West entrance to the Landmark. The design quality also does not extend to the “back” of the proposed addition, facing east and north. Whereas the Rose Center maintains its integrity from all viewpoints, the proposed addition presents stucco-clad box shapes that do not relate to the “canyon-like” architectural expression of the west façade and interior. Two control joints are scribed in seemingly arbitrary squiggles to recall the west façade. There may be a valid argument for a “secondary” façade treatment, but the proposal ignores even the modest scale and texture of the existing buildings’ “backs”. LW! 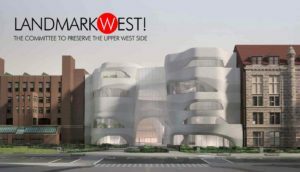 is on record having raised concerns about the impacts this enlargement of the Museum’s footprint into Theodore Roosevelt Park would have on both the Landmark and the Park, two critical public assets serving the Upper West Side community and beyond. We appreciate the efforts towards collaboration between the Museum and the community to adapt and enhance the quality of the Roosevelt Park landscape. It appears that the relocation of a historic granite pier (part of the 1930s Gilmore Clarke-designed perimeter fence enclosure) in order to widen the Columbus Avenue entrance would unnecessarily impact the roots of an existing mature London Plane tree, part of the allée that defines the Columbus Avenue border. Is there a budget to maintain the grassy areas, now shown as accessible in the project renderings? If fencing is anticipated, what will it look like? Is there a security plan? Currently the one narrow gate has bollards. Bollards are to date absent from every rendering although the park aperture has more than tripled in width. How will World’s Fair-type benches and traditional B-pole park lighting be incorporated into the design? Finally, we reiterate our position that the Museum must be compelled—by this community board, the Landmarks Preservation Commission, the Parks Department, and other agencies—to develop a thoughtful, forward-looking plan, including growth boundaries, to maintain a healthy, mutually beneficial balance between the Museum and the Park.